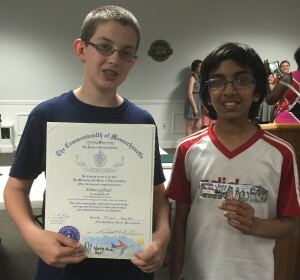 The Framingham Coalition Roundtable Anti Bullying Bookmark Awards Ceremony was held at Town Hall in Framingham where 6th grade scholars Ethan G. and Arnav S. received awards and a printed calendar with their bookmarks. Each also was awarded a gift certificate to Barnes and Noble. State Representative Chris Walsh and Selectman Charles Sisitsky presented the awards to Framingham elementary and middle school winners. We are very proud of these scholars and their thoughtful contributions to the Framingham Coalition Roundtable Anti-Bullying Bookmark Contest.